5 Ways You Can Keep Employees Happy for Little to No Cost – Flexible Benefits Inc.
New Year… New You! Perhaps this year you’re looking to make sure your employees think your company is a great place to work. Happy employees, happy life – right? But, maybe you’re concerned about budgeting for items that make your employees feel like they’re valued. 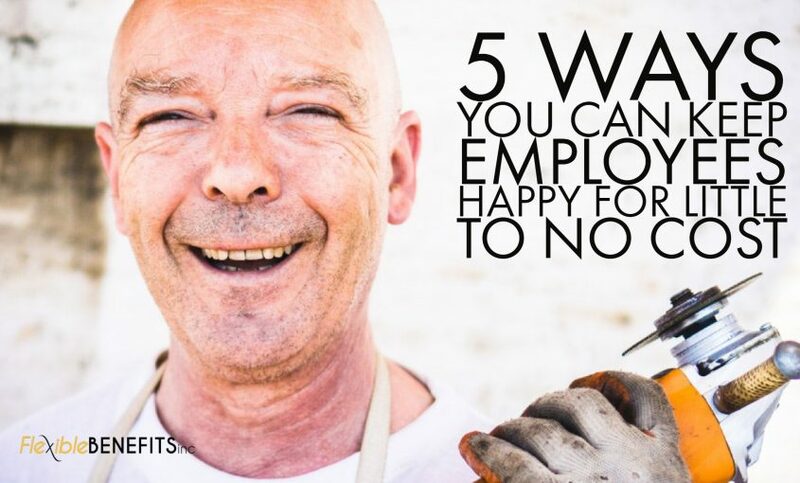 Here are five ways you can keep your employees happy for little, or no cost at all. First, ask some questions. You can start by casually walking around your office and asking personal questions about their family, pets or outside interests. You’ll want to do this slowly so it does not seem impersonal by asking the entire office at once. You can also consider taking your managerial staff, or staff who is performing exceptionally well out to lunch to dive further into their personal lives and professional goals. Next, send a survey, ask your team what they like about working for you, for the company and what they’d like to see changed in the office environment. Surveys do not have to be expensive, but they provide a wide variety of excellent results. In fact, you may be able to send one for free by using online software such as Survey Monkey. It’s simple but so effective. When is the last time you wrote a thank you note? Get out your pen and paper and write to your team. Set a goal of one note per week. Specific sentence on how the person impacted the company, project, etc. It’s a great idea to send the thank you note directly to the person’s home address, so their family can see they work for a company that appreciates and values their work. Development helps your team feel you’re invested in their personal, and professional growth. Think of a few things your company could benefit from – sales training, time management, software training, or interpersonal communication and schedule training once per quarter to increase the efficiency of your workplace. What are your company’s 2018 goals? Do your employees know them? By involving your staff in your goal plans, you’ll find they are more mindful of how their work is reaching the finish line for the company. Schedule a meeting to share where you see the company headed, and how each department can help. We’d be remiss if we didn’t share – a thank you pizza social, or bagels on Friday morning do go a long way – especially if one of your employees forgot their lunch! Surprise the team with a delicious treat and see smiles for days.